1) Are responsibilities for the requisitioning, purchasing, and receiving functions adequately segregated from those for the invoice processing, accounts payable, and general ledger functions? 2) Are responsibilities for the purchasing function adequately segregated from those for the requisitioning and receiving functions? 3) Are responsibilities for the invoice processing and accounts payable functions adequately segregated from those for the general ledger functions? 4) Are responsibilities for the disbursement preparation and disbursement approval functions adequately segregated from those for recording cash disbursements and general ledger entries? 5) Are responsibilities for the disbursement approval function adequately segregated from those for the disbursement preparation function? 6) Are responsibilities for entries in the cash disbursement records adequately segregated from those for general ledger entries? 7) If EDP is used, is the principle of segregation of duties maintained within processing activities? 1) Do requisitioning procedures and controls include the following? a) Initiation of purchases of goods and services by properly authorized requisitions bearing the approval of officials designated to authorize requisitions? b) Using and accounting for prenumbered requisition forms? c) Indicating the appropriation to be charged on the purchase requisition by the person requesting the purchase? d) Before commitment, verification by the accounting and budget department sufficient unobligated funds remain under the appropriation to meet the proposed expenditure? e) Having technical specifications accompanying requests for special purpose (non-stock items) materials or personal services? 2) Do purchasing procedures and controls include the following? a) Structuring purchase authorizations to give appropriate recognition to the nature and size of purchases and to the experience of purchasing personnel? b) Purchase order, contract issuance, and contract approval procedures? c) Periodic review of purchase prices by a responsible employee independent of the purchasing department? d) Use of competitive bidding procedures? e) If practical, rotation on a regular basis of contract or purchasing officer’s areas of responsibility? f) In contracts for materials, services, or facilities acquired on other than a fixed-price basis, requirements for an audit of contractor’s costs prior to approving for payment? g) Procedures for public advertisement of non-stock item procurement in accordance with legal requirements? h) Periodic review of recurring purchases and documentation of the justification for informal, rather than competitive, bids? i) Established, documented, and distributed policies regarding conflicts of interest and acceptable business practices? j) Issuing purchase orders and contracts under numerical or some other suitable control? k) Obtaining an adequate number of price quotations before placing orders not subject to competitive bidding? l) Prohibiting split orders to avoid higher levels of approval? m) Maintenance, by the purchasing department, of price lists and other appropriate records of price quotations? n) Maintenance of a record, by the purchasing department, of suppliers who have not met quality or other performance standards? o) Modification of procedures for disbursement of funds under grant or loan agreements and related regulations imposing requirements differing from the organization’s normal policies? p) Controls to identify, before order entry, costs and expenditures not allowable under grant programs? q) Maintenance of an adequate record of open purchase orders and agreements? r) Prohibiting or adequately controlling purchases made for the accommodation of employees? s) Considering bid and performance bonds if construction contracts are to be awarded? t) Predetermining selection criteria for awarding personal service or construction contracts and requiring adequate documentation of the award process? u) Subjecting changes to contracts or purchase orders to the same controls and approvals as the original agreement? 3) Do receiving procedures and controls include the following? a) Preparation of receiving reports for all purchased goods? b) Procedures for filing claims against carriers or vendors for shortages or damaged materials? c) Taking steps to ensure goods received are accurately counted and examined, to ensure they meet quality standards? d) Maintaining a permanent record of material received by the receiving department? e) Numerically accounting for or otherwise controlling receiving reports, to ensure all receipts are reported to the accounting department? f) Sending copies of receiving reports directly to purchasing, accounting, and (if appropriate) inventory record keeping? g) With respect to procurements of special-purpose materials, services, or facilities, assigning a government technical representative to monitor and evaluate contractor performance and to approve receipt of services? h) If a receiving department is not used, adequate procedures to ensure goods for which payment is made have been received; verification, by someone other than the individual approving payment, that goods have been received and they meet quality standards? 4) Does invoice processing include the following? (i) Copies of purchase orders and receiving reports to be obtained directly from issuing departments? (ii) Invoice quantities, prices, and terms to be compared with those on the purchase order? (iii) Invoice quantities to be compared with those on the receiving report? (iv) Accuracy of calculations to be checked, as appropriate? (v) Timely payment of invoices, to avail the entity of available discounts? b) Receiving all invoices from vendors in a central location, such as the accounting department? 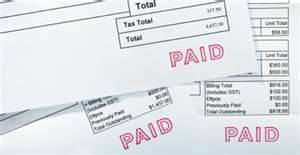 c) Procedures ensuring the accounts payable system is properly accounting for unmatched receiving reports and invoices? d) Review and comparison of contractors’ requests for progress payments under long-term contracts to contractors’ efforts and results? e) Procedures for processing invoices not involving materials or supplies (for example, lease or rental payments, utility bills, etc.)? f) Procedures to ensure accurate account distribution of all entries resulting from invoice processing, including the following? (i) Comparison of monthly statements with accounts payable balances? (ii) Reconciliation of subsidiary ledgers with control accounts monthly? g) Access to EDP master vendor file, if applicable, limited to employees authorized to make changes? h) Maintenance by accounting department of a current list of those authorized to approve expenditures? i) Procedures for submission and approval of reimbursement to employees for travel and other expenses? j) Establishment of control by the accounting department over invoices received, before releasing them for departmental approval and other processing? k) Review of the distribution of charges in the accounting department by a person competent to pass on the propriety of the distribution? l) Review and approval of invoices (vouchers) for completeness of supporting documents and required clerical checking by a senior employee? m) If an invoice is received from a supplier not previously dealt with, taking steps to ascertain the supplier actually exists? n) Making payments only on the basis of original invoices? o) Assigning responsibility for ensuring all cash discounts are taken and, if applicable, exemptions from sales, federal excise, and other taxes are claimed? p) Referring differences in invoice and purchase order price, terms, shipping arrangements, or quantities to the purchasing department for review and approval? q) Recording and following up on partial deliveries by the accounting department? r) Promptly notifying the accounting and purchasing departments of returned purchases and correlating such purchases with vendor credit advices? s) Reviewing the program and expenditure account to be charged for propriety and budget conformity? t) Having check signers or other responsible officials determine restricted revenues are expended only for restricted purposes? u) If applicable, procedures to ensure adjustment of the reserve for encumbrances, when invoices are prepared for payment? 5) Do disbursements procedures and controls include the following? a) Warrants, sight drafts, and checks to be signed after disbursement has had final approval? b) Control of warrant, sight draft, and check-signing- machine signature plates and usage? c) Immediate notification, as applicable, to banks, State Treasurer, and State Controller, of newly authorized warrant, sight draft, and check signers? d) Immediate notification, as appli­cable, when authorized signers leave the unit or are otherwise no longer authorized to sign? e) Invoices and supporting documents furnished to the signer prior to signing the warrant, sight-draft, or check? f) Reasonable limits set on amounts payable by facsimile signature? g) Two signatures required on warrants, sight drafts, or checks over a stated amount? h) Signature plates kept in the custody of the person whose facsimile signature is on the plate, when the plate is not in use and plates used only by that person? i) Readings of signing machine controlled and recorded by the signer, or an appropriate designee, to ascertain all signed warrants, sight drafts, or checks are properly accounted for, by comparing to document control totals? j) Invoices and supporting documents cancelled by, or in the presence of, the signer at time of signing? k) Signed warrants, sight drafts, or checks delivered directly to the mail room, making them inaccessible to persons who requested, prepared, or recorded them? l) Warrants, sight drafts, and checks cross-referenced to vouchers? m) Warrants, sight drafts, and checks controlled and accounted for, with safeguards over those unused and voided? n) Drawing warrants, sight drafts, or checks to “cash” or “bearer” prohibited? o) Prompt recording of signed and issued warrants, sight drafts, and checks? 6) Do procedures for accounts payable, encumbrances, or obligations included the following? a) Regular comparison of statements from vendors with recorded amounts payable? b) Monthly reconciliation of outstanding purchase orders to the reserve for encumbrances? c) Recording encumbrance entries based only on approved purchase orders? d) Procedures ensuring accounts payable and encumbrances are applied against the appropriate account? e) Procedures ensuring department heads are notified of payments made against accounts payable and encumbrances? 7) Do general ledger procedures include the following? a) Regular preparation of trial balances of reserve for encumbrances and accounts payable? b) Checking the footing and testing the trial balances to the individual items, as well as comparing the total to the general ledger balance, by an employee other than the accounts payable clerk? c) Posting transactions between funds in all affected funds, in the same accounting period, and on a timely basis? 8) Do grant- and entitlement-monitoring procedures and controls include the following? a) Disbursing grants only on the basis of approved applications? b) Defining (for example, in regulations) and communicating to grantees their reporting and compliance requirements? c) Procedures to monitor grantee compliance with grant terms? d) Subjecting financial operations of grantee to periodic and timely audit? e) Sufficiently timely monitoring of recipients to permit curtailment of any abuse before completing funds disbursement? f) Disbursing funds to grantees only on an as-needed basis? g) An appropriate level of grant approval authority? h) Investigation of failure by grantees to meet financial reporting requirements on a timely basis? i) Requiring grantees to evidence correction of previously detected deficiencies before approval of an extension or renewal of a grant? j) Entitlement procedures ensuring statistics or data used to allocate funds are accurately accumulated (for example, census bureau forms)? k) Requiring statements of recipient compliance with entitlement conditions (for example, statement of assurances) to be filed and having a responsible official review them? l) Review of audited financial statements or other compliance requirements of entitlement recipients on a timely basis and investigation of unusual items?